Although natural communities are named after plant species, animals are a critical part of these communities. About 260 species of animals live in Rock Creek Park, not counting insects and other invertebrate animals.1 Some live here all year, while others, such as migrating songbirds, are present only in certain seasons. Check out the list of Commonly Seen Animals of Rock Creek Park. While hiking, you’re likely to see and hear birds, especially in the spring when males are singing to attract mates and defend their territories. 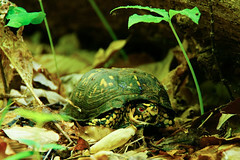 If it’s a warm sunny day, you may see turtles sunning on a log, although they may slip into the water as you approach. To see and hear even more wildlife, find a comfortable spot and sit quietly for awhile. Look for squirrels chattering in the trees, eastern box turtles ambling through the leaves, and red foxes or coyotes out looking for a mouse to eat. 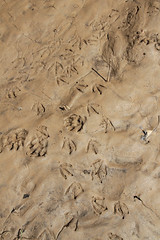 As tracks in the mud show, floodplains are a good place to find animals. In wet areas, look on reedy vegetation for dragonflies. Look among flowering plants for bees and butterflies. You might be able to find tracks of deer, raccoons, birds, and other animals in the the wet sandy soil along the stream. Rock Creek Park’s Chestnut Oak / Mountain Laurel Forest is a good place to look for migratory songbirds during spring and fall migration, because it occurs at higher elevations and receives the first morning sun. Animals rely on plants for food, shelter, nesting sites, shade, perching sites, and protection from predators. One of the reasons that Rock Creek Park can host so many animal species is that the park’s wide variety of natural communities provides a wide variety of habitats. Animal habitats at the park include floodplains, seepage swamps, moist coves, steep hillsides, bluffs, and dry hilltops. Park managers also maintain some open meadows to accommodate animals that prefer this habitat. Some animals need the habitat transitions and edges that the park provides. Red-tailed hawks, for instance, roost and build nests in large tree forks in the canopy of mature upland forests, near open meadows, where they mainly hunt small mammals (such as meadow voles) from perches along the edge. The uncommon gray petaltail (Tachopteryx thoreyi), unique among dragonflies for its wide-set eyes. Photographer: Vicki DeLoacheEven native insects depend on the plant communities at Rock Creek Park. 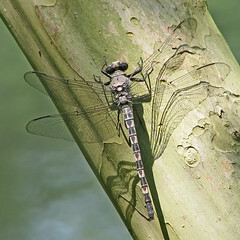 The gray petaltail—a beautiful gray and black dragonfly, rare in Maryland—breeds in little forest seeps, and can be seen in summer months perching on trunks of nearby trees. Its larvae live buried in the mud of these seeps, eating mosquito larvae.3 Their rarity in the Mid-Atlantic may be due to the disappearance or decline in quality of these groundwater seeps. Leaves and tender twigs provide food for deer, rabbits, squirrels, and other animals. Seeds are important food source for many animals. Wildlife managers call edible seeds “mast.” Seeds encased in a dry, hard shell are hard mast , and seeds surrounded by pulpy flesh and thin skin are soft mast . The outer shell of hard mast such as an oak acorn is like a coat of armor—it protects the seed inside from drying out and allows it to last for a long time on or in the ground without decomposing, making it an important winter food. Eastern chipmunk (Tamias striatus) eating an acorn. Photographer: Graham EtchesOaks such as white oak produce huge crops of acorns (hard mast) that are eaten by many of the animals in the upland forests at Rock Creek Park. A high-energy food source, acorns are the most important wildlife food in the deciduous forests of North America.4 White-tailed deer, white-footed mice, squirrels, eastern chipmunks, raccoons, red fox, woodpeckers, blue jays, crows, white-breasted nuthatches, wood ducks, and mallards all rely on acorns at Rock Creek Park. Soft mast is perishable, but is a vital summer food, supplying vitamins and carbohydrates, and even some of the moisture that wildlife needs. Producers of soft mast include flowering dogwood (a favorite of many birds and mammals), blackgum, blueberries, black huckleberry, common serviceberry, black cherry, wild grapes, eastern poison-ivy, and mapleleaf viburnum. 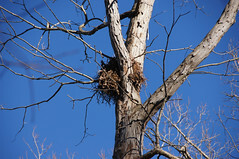 Squirrel nest in white oak (Quercus alba). 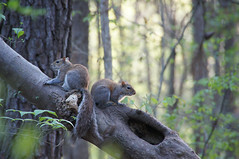 Photographer: Matt JonesSquirrels and many birds build nests in trees. Look in the forks of tall trees for nests of squirrels or birds of prey. Many woodland creatures nest in tree cavities, including owls, American kestrels, wood ducks, wrens, Carolina chickadees, tufted titmice, white-breasted nuthatches, great crested flycatchers, several species of woodpeckers and bats, squirrels, and raccoons. Cavity nesters make use of trees such as blackgum, American beech, American sycamore, green ash, white ash, red maple (and other maples) and American basswood that tend to readily form natural cavities or hollows as wounds from broken branches, fire, decay, etc.5 6 Two eastern gray squirrels (Sciurus carolinensis) pause in a chase on a hollow red maple that may be their home. Dead standing trees and fallen trees on the forest floor serve as nesting, observing, and resting sites for reptiles, amphibians, small mammals and birds. Deciduous trees overhanging the creek keep water temperatures cool in summer for fish and other water-dwellers, and also supply organic material ( detritus ) to the water. This provides food for invertebrate animals such as aquatic insects—important not only to fish but the entire food chain . Animals clearly need plants, but they also provide services for plants ranging from pollination and seed dispersal to protection from pests. 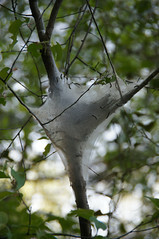 Eastern tent caterpillar (Malacosoma americanum) nest in spring. Photographer: Matt JonesAnimals also play an important role in controlling insect and small mammal populations, helping to maintain ecosystem health. Several resident and migrating birds help control colonies of native eastern tent caterpillars, which build silky tent nests in crotches of trees such as black cherry in spring. These caterpillar colonies can strip a tree of all its leaves. However, Carolina chickadees (tiny year-round inhabitants at Rock Creek) and black-throated green warblers (passing through the park on their migration route) may tear open newly-forming tents in spring, eating dozens of the young, small larvae, sometimes before they have done much leaf damage. Rock Creek Park is missing some of its former animal inhabitants whose presence likely helped shape the vegetation seen today. Why are these diverse species gone or declining? As wonderful as Rock Creek Park is, it’s simply not big enough to support large predators, or some species of bird that require larger tracts of intact forest. For ground-nesting birds and other small animals, it may be the loss of critical understory shrubs and herbs to hungry deer. In other cases, new diseases, environmental toxins, more frequent turbulent floods, predators or competitors, or even non-native invasive plants have sufficiently changed the environment so that these species no longer thrive in the Rock Creek area. Rock Creek Park is currently home to several animals of particular conservation concern. See Species of Concern at Rock Creek Park in Stewardship & Ecological Threats. 1. Cornell Lab of Ornithology. 2015. Red-shouldered Hawk. 3. Maryland Department of Natural Resources. 2004. Rare, threatened and endangered animal fact sheet: gray petaltail. 4. McShea WJ, Healy WM. 2002. Oaks and acorns as a foundation for ecosystem management. Pages 1-9 in Oak forest ecosystems: ecology and management for wildlife (W.J. McShea and W.M. Healy, editors). 5. Perkey A, Wilkins B, Smith HC. 1993. Managing wildlife crop trees. Crop tree management in eastern hardwoods. 6. Fergus C, Hansen A. 2005. Trees of New England: a Natural History, page 67. 7. Hammerson GA. 2004. Connecticut Wildlife: Biodiversity, Natural History and Conservation. 8. Anderson R. 2009. Personal Communication, 4/18/2009. Sierra Club outing guide, and D.C. birder. 9. Thompson B. 2009. Bill of the Birds: It’s Getting Cuckoo. 10. USDA NRCS, Wildlife Habitat Council. 1999. Ruby-throated Hummingbird (Archilochus colubris). 12. U.S. Fish and Wildlife Service. 2007. Hay’s Spring amphipod (Stygobromus hayi). 13. The National Park Service Biodiversity Database. 2014. NPSpecies - The National Park Service Biodiversity Database. Secure online version.